We are so excited to share this amazing recipe from Nopi. At least in Wisconsin, we don't tend to eat much eggplant. At least personally, I've never really known what to do with it or how to make it taste good. In many of my early attempts, it always ended up as this mushy mess that I wanted nowhere near my plate. That being said, this recipe totally blew me away. Now THIS is how you do eggplant! Give it a go, we promise you won't be disappointed with this flavorful result! It's recipes like this that show us that we are in the right industry...LOVE food and LOVE black garlic! Preheat the oven to 425°F/220°C (390°F/220°C convection). Cut each eggplant in half lengthwise, and then again widthwise. Cut each section into wedges about 1 1/4inches wide and 4 inches long, and place in a large mixing bowl along with the olive oil, 1 tablespoon of salt, and a good grind of black pepper. Mix well, then spread the eggplants out on two parchment-lined baking sheets—you don’t want them to be overcrowded—skin-side down. Roast in the oven for about 40 minutes, until well cooked and golden brown. Remove from the oven and set aside to cool. Place all the ingredients for the dressing in the small bowl of a food processor, along with ¼ teaspoon of salt. Blitz for about 2 minutes, until a very smooth paste is formed. Place the eggplant in a large mixing bowl. Add the garlic dressing and use your hands to stir very gently: you want the eggplant to be coated without disintegrating completely. Leave for an hour or so, if there is time to spare. 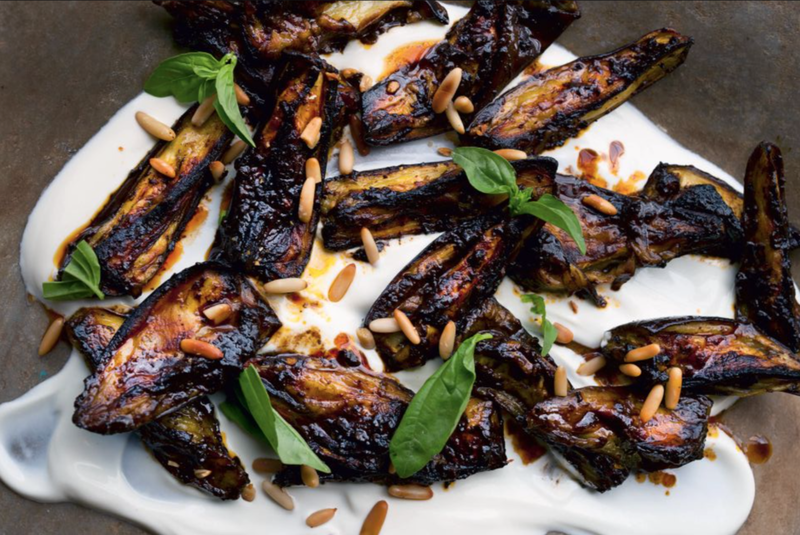 Spread the yogurt out on a platter or individual plates and arrange the eggplant wedges on top. Sprinkle over the basil leaves—tearing the large ones as you go—and the pine nuts. Finish with a drizzle of olive oil and serve.